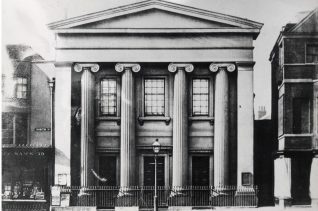 The original chapel of the Countess of Huntingdon’s Connexion, was founded in Brighton in 1761, today the sect has 23 congregations in the UK. The Countess was born Selina Shirley in 1707, and married the 9th Earl of Huntingdon in 1728. 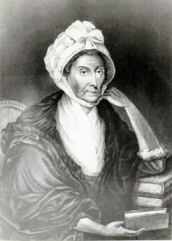 Having joined the Methodist Society in 1739, Lady Huntingdon went on to form the Countess of Huntingdon’s Connexion which was basically a Calvinistic movement within the Methodist church. She played a prominent part in the religious revival of the 18th century. Countess of Huntingdon: Royal Pavilion and Museums Brighton and Hove. Countess Huntingdon came to Brighton in 1755; she bought a house in North Street and built a private chapel in its grounds. The Countess hoped that the sea air would be beneficial to the health of her ailing son; sadly both her sons died of smallpox. Returning in 1760, she invited the Rev George Whitfield, a very famous Methodist preacher to speak in Brighton. As the popularity of the ‘new faith’ grew, the Countess opened her small chapel to the public. The congregation continued to grow and the chapel was enlarged many times over the years. Eventually in 1822 the Countess’s former residence was converted into a long gallery and a Doric entrance was made in North Street. 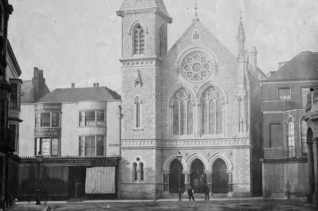 In 1870-1 the church was entirely rebuilt by John Wimble in Early English style in flint and grey stone. There was a graceful north-eastern spire, and a triple-arched entrance supported by granite pillars with elaborate capitals, while the interior had galleries on all sides, excellent stained glass windows, a marble pulpit, and room for about 900 worshippers. 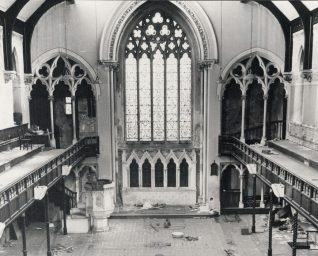 The new church opened on 20 March 1871 and was initially well-attended, but eventually congregations dwindled and it proved impossible to keep the building in good repair. 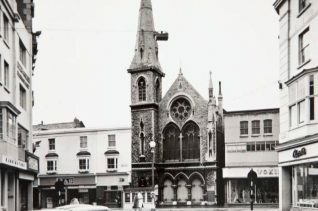 The church closed in September 1966 and was demolished in February 1972, although the spire had been taken down in November 1969. My GGGrandfather William Parnacott married Caroline Seymour (both born in Bath) in the Countess of Huntingdon’s Chapel in Bath in 1854. He then moved to Herstmonceux, East Sussex as an Independent Minister of the Congregational Church there (now Free Church). His daughter Laura married my GGrandfather Horace Light, a tailor from Brighton! There is also a Countess of Huntingdon’s Chapel in Worcester. 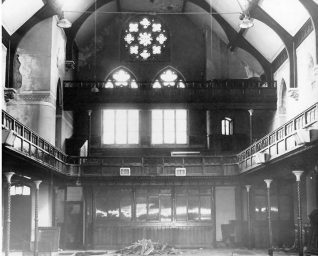 When The 3rd Brighton company of the Boys` Brigade were `bombed out` of Gloucester Place, Church they found a temporary home in the Countess of Huntingdon’s as the 19th Brighton before moving to Dorset Gardens to become the 6th Brighton BB. during the 1940s and early 50s. 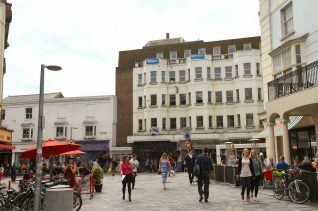 The picture of Lady Huntingdon at the top of the page appears regularly on the ‘net attributed to Brighton’s Phoebe Hessel – wrongly, it seems. I wonder how the mistake originated. Anyone know? Geoffrey Mead?